Community Standards and Neighbourhoods enhances a livable city by supporting safe properties and a civil urban society that meets the standards and expectations of communities. This is accomplished by the identification of standards, together with the education, compliance and, where necessary, enforcement initiatives required to uphold them. We work directly with citizens in the neighbourhoods in which they live to promote a culture of civic engagement, build great neighbourhoods, enhance family and community capacity, coordinate service delivery, operate and maintain parks, enhance the urban forest, and invest in revitalization initiatives. 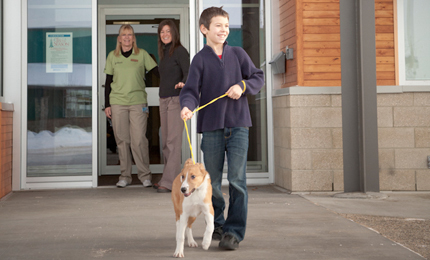 Animal Care & Pest Management operates Edmonton's Animal Care & Control Centre (the pound) as well as controls pests that affect City property and the health of citizens. Owned stray pets are cared for until they are returned home or are transferred to the Edmonton Humane Society for adoption. Pest control includes providing a mosquito control program and the control of invasive insect species on Edmonton's street trees. Capital City Clean Up is a litter reduction and graffiti prevention program developed to help keep the city clean, safe and attractive. Community Peace Officers encourage the safe use and enjoyment of public and private property and parkland. Peace officers are not police officers. Animal Care & Control sustains responsible pet ownership including licensing of cats and dogs and resolving concerns like barking, roaming and biting. Community Standards Peace Officers are on the road for safety enforcing littering, secure loads, roadway signage and smoking regulations. City Park Rangers ensure that the river valley is a safe and enjoyable recreational space. Complaints & Investigations provides effective enforcement of the Community Standards and Public Places bylaws that regulate nuisance conditions in Edmonton. Concerns such as untidy property, smoky fire pits, machine noise, smoking, weed control, sidewalk snow removal and parking control are resolved through municipal enforcement action. The Edmonton Combative Sports Commission conducts licensing and regulation of combative sports in Edmonton. The Commission provides expertise in governance and administration the sports MMA, boxing and wrestling. The Commission ensures a safe competition environment and provides officials such as referees, judges and ringside physicians for combative sports events. The Neighbourhood Services Section is responsible for supporting community development in neighbourhoods. It is home to Neighbourhood Resource Coordinators (formerly known as Community Recreation Coordinators CRCs) who aspire to build collaborative relationships in every neighbourhood in Edmonton. The staff support citizens to develop strategies for neighbourhood parkland and amenity development. The Section also provides small grants and permitting for local events and programs that enhance neighbourhood liveability. The Section manages the City's Neighbourhood Revitalization Program, EFCL Liaison, Abundant Community Edmonton and Building Community Through Recreation. Edmonton's parking services program provides foot patrol, marked car patrol and special event services to ensure public safety with respect to vehicles. The program offers a private agency training program for apartment and condo managers to conduct parking enforcement on private property. A yearly awareness campaign aims to curb illegal parking in disabled parking stalls.